A modest theatrical hit this past summer, The Campaign is a broad political comedy starring Will Ferrell and Zach Galifianakis as competing congressional candidates. Cam Brady (Ferrell) has served four terms as a North Carolina congressman. He’s running unopposed for a fifth term, meaning he can get away with bloody murder during rallies, saying and doing pretty much whatever he wants. That is, until the scheming Motch brothers, a pairs of unscrupulous businessmen loosely modeled on the Koch brothers, decide to find someone to compete with Cam. 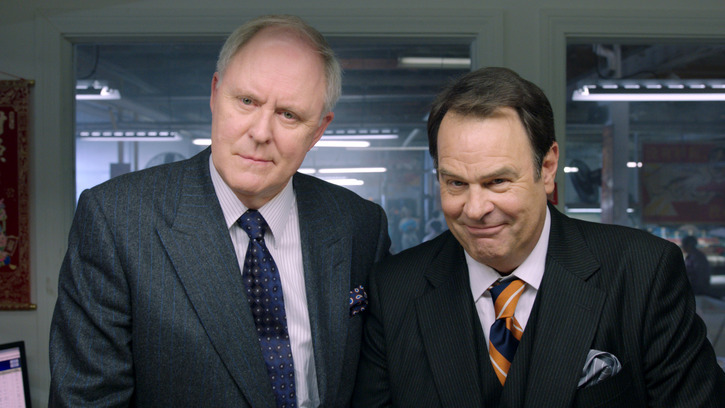 Wade (Dan Aykroyd) and Glen (John Lithgow) want to build some Chinese-style sweatshops in North Carolina. So they handpick an idiot, Marty Huggins (Galifianakis), to be their puppet. Anyone concerned about being offended by an anti-Republican or anti-Democrat bias needn’t worry. Chris Henchy and Shawn Harwell’s screenplay isn’t really aiming for biting satire in any particular direction. Cam, a democrat, is an inappropriate, lying, bumbling idiot. Marty, running as a Republican, is also a total buffoon. The writers and director Jay Roach (all three Austin Powers and Meet the Parents) are after laughs and nothing more. To their credit, laughs are what they get—most of the time, at least. As with so many Will Ferrell movies, he plays his role like a caricature, leaving little room for surprise once we get the gist. 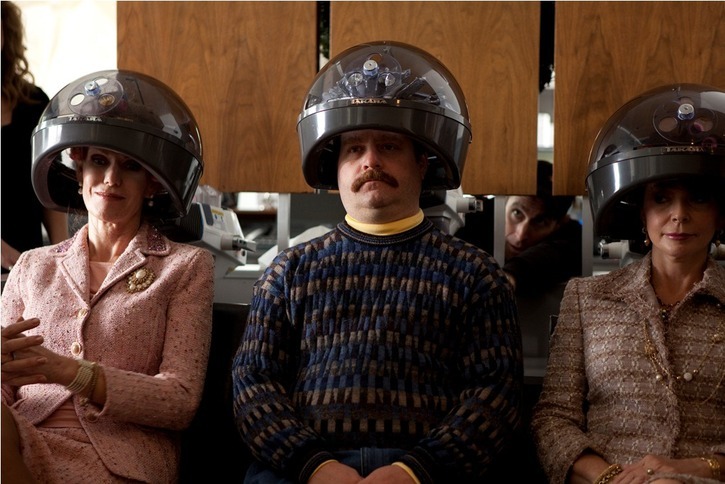 Galifianakis is no less broad, playing Marty as a dim-witted sissy. As the gears of the plot grind forward, their interactions begin to get a little tiring. But not so much that I won’t watch it again. In fact, I have a feeling The Campaign will hold up very well—the funniest moments are funny enough to sustain repeat viewings. As the campaign wears on, Cam and Marty become increasingly vicious in their attempts to discredit each other. Some of these gags are a little more predictable than others, such as when Cam butchers the Lord’s Prayer during a debate. But when Cam mistakenly leaves a crude message on a religious family’s answering machine, it’s a classic Ferrell moment (as are his attempts to minimize the phone message’s negative impact). Throwaway bits, like Marty quoting Salt-N-Pepa while trying to open a door (“Push it real good”), struck me as hilarious, even though I’d seen that specific bit in the trailer countless times. Even as the riffing starts falling a bit flat late in the film, there’s enough inspired moments here (such as Cam accidentally punching out the dog from The Artist) to make it easily recommendable. On Blu-ray, The Campaign looks exactly the way we’ve come to expect recent movies to look in high definition. The 1080p transfer, framed at 1.85:1, is sharp as a tack. Colors pop, fine detail is impressive—pretty much everything about the transfer is right on the money. Also essentially flawless is the DTS-HD MA 5.1 soundtrack. Being a dialogue-driven comedy, this is hardly demo-worthy audio. But it doesn’t disappoint in any area that counts. The surround channels, while not taxed, efficiently deliver atmospheric sound such as crowd noise. The dialogue is what matters most here, and at no point does it present any problems. Not much here in the way of supplemental material. There’s about 15 minutes of deleted scenes (which also appear as the sole extra on the included standard DVD). “Line-o-Rama” is a short montage of various actors trying out different improvised lines. This actually underlines a potential problem that may have at least partially sabotaged the film: indulgence. Write funny dialogue, don’t rely on the actors to improvise endlessly and hope something sticks. Of course, with guys like Ferrell and Galifianakis, many of these ad-libs are very funny. It’s just that they work better in smaller doses, not tons of them piled on top of each other. The gag reel serves up the standard selection of flubs. 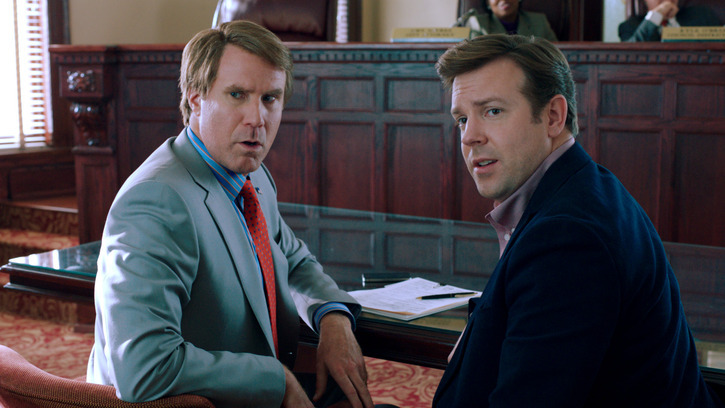 The Campaign has plenty of laughs throughout its brisk 96-minute running time. That’s the extended cut, the only one I’ve seen, so I can’t comment on what was added to the 85-minute theatrical cut. It’s crude as all get-out, definitely earning its R rating. It also elicits laughs often than not, ultimately the only standard of measurement that means anything when it comes to comedies.